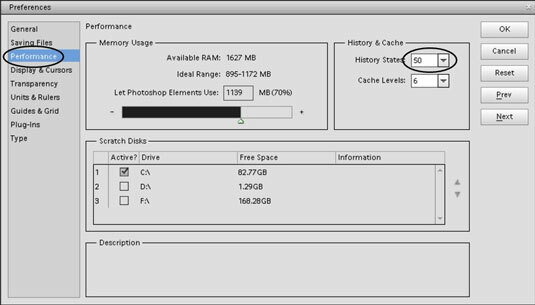 As you might expect, the Undo command in Photoshop Elements 11 is found on the Edit menu. To undo an editing step, you simply choose Edit→Undo or press Ctrl+Z or Command+Z. This simple command helps you correct a mistake or toss away an experimental edit that doesn’t work for you. When you open the Edit menu, you find the Undo command at the top of the menu. In addition, you find the name of the edit you last applied to the image. In this figure, a fill is applied within a selection. On the Edit menu, the menu command appears as Undo Fill. If you make several edits in Elements, you can take advantage of the Undo command several times. The number of undo operations you have available is determined in the Preferences dialog box. To adjust the number of undo actions you want available, choose Edit→Preferences (Windows) or Adobe Photoshop Elements Editor→Preferences (Mac) and the Preferences dialog box opens. Alternatively, you can press Ctrl+K (Command+K) to open the Preferences dialog box. In the Preferences dialog box, you click the Performance item in the list on the left to open the Performance preferences panel. Below the History & Cache item on the right, you find History States, as shown. The setting you make here — by adjusting the slider or by typing a number in the History States text box — determines the number of undos you have available when you choose Edit→Undo or press Ctrl+Z (Command+Z). By default, the number is set to 50, meaning you can step back to undo your last 50 edits. You also have a command for Redo on the Edit menu. If you choose Undo from the Edit menu or press Ctrl+Z (Command+Z) and then change your mind, you can always just redo that last undo: Choose Redo or press Ctrl+Y (Command+Y), and the last undo returns to the state before you chose to undo the edit. The number of redos you have is the same as the number of undos. For example, if you set the History States to ten in the Performance preferences and make ten edits and then successively press Ctrl+Z (Command+Z) ten times, you can successively press Ctrl+Y (Command+Y) to redo all ten undos.